For the second edition of making natto, I traded my homemade incubator (Styrofoam cooler with a light bulb) for a slow cooker. You can read about that in the post How to Ferment Natto. This one didn’t go so well. 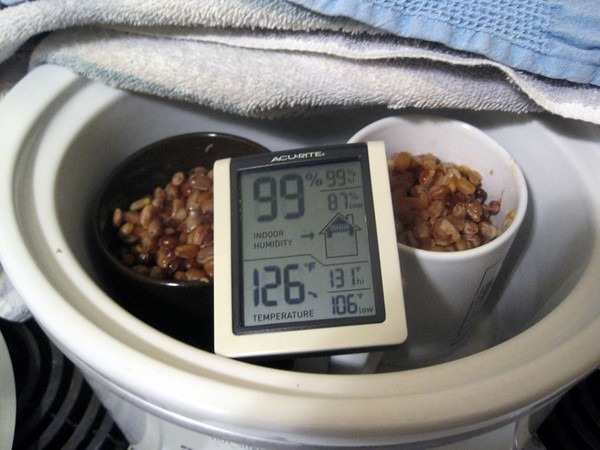 Natto needs a stable temperature between 100-113 F for optimal fermentation. Slow cookers, even on the warm setting, will get too hot with the lid closed. So I placed a dish towel over the slow cooker and set the control to WARM. At first it was losing too much heat, so I added a second dish towel. This seemed to be working. It was keeping a perfect temperature of 106 F for the first 8 hours. Then I went to sleep. When I woke up and checked on the natto, the temperature had jumped to 131 F. I was able to get the temperature back down to a safe range for the last few hours, but the damage was done. Natto that exceeds the optimal temperature range doesn’t have the slimy gooey texture that makes it natto. It tastes rather bland and boring. I’m thinking that the high temperatures either killed or greatly damaged the natto culture. You can see that the natto started at 106 F and then spiked to 131 F. Not sure if the humidity plays a role in natto fermentation, but you can see it got to 99% under the dish towels. Not sure why it spiked. I’m guessing that the water bath evaporated and this made the inside of the slow cooker hotter. This is an old slow cooker I got at a yard sale for $5. I suppose at this point, I could pimp out my slow cooker by adding some electronics to get an optimal temperature, but I have zero skills in electronics. Plus I already have that working incubator method. But I do like the elegance of using the slow cooker. UPDATE May 2016: This recipe was sent to me and I felt it was worth sharing. Soak 350 grams beans Thursday morning in lots of water, just drain them from soaker to mesh steamer insert Friday, and pressure steam for 45 minutes with 1.5 cups of water below, with a 20 minute cooldown after completion before releasing steam. The start to finish on that is about 75 minutes but it’s all unattended. boil for 5 minutes spoons or a paddle to stir the natto in, and a plate to act as a spoon rest. Pull the insert, and dump all but a few tablespoons of the liquid out of the pot. …and set the instant pot to yogurt setting for 24 hours to 36 hours, finishing at a convenient time for you. That takes about 20 minutes. Finally Saturday or worst case Sunday morning, boil a couple spoons and paddles a small plate to use as a spoon rest, and the first glass storage tray. Every 5 minutes remove the current tray to cool, drop the next tray in to boil, and load the cooled tray with 1/4 of the beans. Total time elapsed about 30 minutes but with lots of time for chores along the way. I haven’t been boiling the plastic lids, but have had no problems as they’re not touching the beans. The output has been fine, four glass trays of four servings each. Let them rest in the refrigerator for two days, then freeze all but the next to be eaten. I’m not sure I’d bother without the pressure steamer/yogurt maker though. Having it all be one pot with minimal fuss is what beats the local market in Japantown San Francisco at three packages for USD 2.00. @Gayle – That is pretty cool. I guess you would use your own thermometer to define what the control settings were? I mean do you set by trial and error? Seems like this would be a great application for sous vide. It’s an expensive tool for at home (though you can definitely do lower cost DIY versions), but it certainly would be da bomb at keeping the natto at the right temp. Though if oxygen is required, it might be more of a challenge. @All – I think will attempt to pimp out my crock pot. I have a back up, plus I can always get more to practice with at Value Village/Goodwill for under $10 should I mess something up. @Michael – Perhaps. A bit pricy though. I just bought an Instant Pot. It is an electric pressure cooker that also has a yogurt function. I thought it would be perfect for making natto. The yogurt function works perfectly for the fermentation. However, I cannot figure out how long to pressure steam the beans for in an electric pressure cooker (max 11.6psi). Once I get this figured out I should be set. So far 55 minutes was too short. Beans were too hard. @Tami – Interesting experiment. I have no experience with pressure cookers, but I would think the temperature would be too high for natto. Also the live cultures do take time. Doubt that can be accelerated much. Actually the yogurt function works perfectly! It keeps the temp between 96.8 – 109.4. I set it for about 20 hours. I use this function after I pressure steam the beans. It’s just that I haven’t figured out the best cooking time for the beans. My first 2 batches were a little too hard and I read on a blog that the beans need to be almost too soft. I’ll keep trying! Optimal temperature can be maintained by stringing a 40 or 60 watt lightbult into your oven. My old oven needed a 60 watt bulb, but my new smaller one maintains temperature with a 40 watt bulb. The temperature of the kitchen air, how tightly the oven closes, and heat escape through the burner openings are factors, so experimentation might be necessary. By the way, brown sugar and a little salt result in amazingly gooey and stringy batches. @David – That is a great tip. I’m eager to test that out when my move is complete. I think a food dehydrator would work to incubate because it will hold to a constant temperature. You’ll need the fruit leather special inserts tho to keep the slime from seeping thru to lower tiers of the dehydrator. Will try it soon and let you know hot it works. Just completed my first batch of “not quite” natto. Tastes good, but strings are so few as to be nonexistent. Not sure where I went wrong. Followed all steps, saw white stuff growing on the beans in the incubator, but no “neba neba” to be found. @JACKIE – I just read the tip to keep the natto in the refrigerator a week to age and develop the stringiness. hi Michael hope the Bay Area is treating you well. You were missed at paleoFX in Austin this year. for trey and myself the word of the weekend was nuance and the big takeaway was gut microbiome for all manner of health benefits. I’m finally taking a stab at making homemade natto as we speak. I bought natto at Uwajimaya. my criteria for selecting which product was based on which had the fewest ingredients. Many of the products there are loaded down with a bunch of crap. now that I have my starter culture, albeit in (probably GMO) soybeans, I intend to switch to black beans. I looked up which legumes have the highest protein as well as the highest antioxidants. as mass markets legumes go soy and peanuts have the highest protein but, as we know, are loaded with problematic substances. White beans are especially high in protein but lack the colorful antioxidants. enter frijoles negros. next I am pressure cooking the dry black beans to soften them but also to sterilize them without the use of any chemicals. After this I will put them in my tub-style yogurt maker and add the store bought natto. all recipes for both the pressure cooker stage and yogurt maker stage will come from the web. I had as zen moment one time about both legumes and milk: from a food standpoint they are both best viewed as a growth medium, not as a finished food by themselves. @Alison – Nice to hear from you. I’ll be interested to hear how the black beans go. I’ve been buying the “crap” versions of natto since I left Seattle and moved into a shared kitchen. My guess is the good far outweighs the bad, even in the worst quality ones. @ MAS everything turned out well: stinky and gooey just like it’s supposed to be. And, has the added nuance of being “black beanie”. I think the next time using white beans might actually be a good idea. I could save my “natto-kin” and use a different bean every time making some kind of rainbow natto. Also, the tub I used to make it contains considerably more than natto than you would typically buy at the store. so as I work my way down the tub it may be more mature than what I am currently eating off the top. Hi – I have been trying, like so many, to make the illusive Natto. I tried the first time in the oven – mmm best not describe the offering. The second time I cooked the beans in the slow cooker, added Natto culture, then put it in my excalibur food dehydrator. There were some strings, but I didn’t know then it was supposed to fester for a further week in the fridge. So, I will be giving that a go. The last time I tried, I cooked the beans in the slow cooker, then added some Natto from a commercial bought product, placed it in the dehydrator and the net result was a very stringy but strong amonia smelling natto. So, back to the drawing board. I have bought a pressure cooker and I am going to have another go at the culture and see what happens with the further culturing in the fridge. I make kefir milk and water which is brilliant. Just have to master these pesky beans. Will get back with results, for anybody that is interested. I am making this as I have hashimotos and am hoping it helps. Well I succeeded at last!!!! This batch was perfect and I am so, so pleased. I can’t believe making stinky soy beans could make anybody this happy. If anybody is interested, I can give you the destructions for what I did. I do know, temperature for fermenting is critical and my purchased oven temperature gauge was worth every penny. @Ann – Congrats! Feel free to post your method below. Or you could email it to me with photos and I’ll make a separate post –> [email protected] Either way!